There is a ton more on the aircraft at the reference link below. 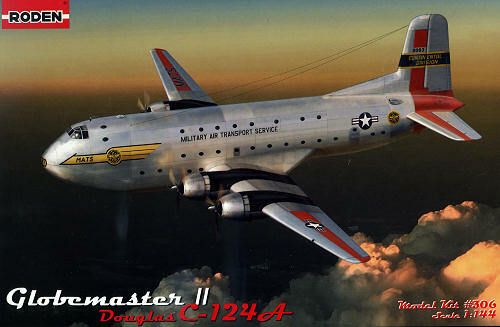 It is nice to see a 1/144 injected plastic C-124. I have the Anigrand 1/72 kit about 85% complete and it has been in that state for several years as every time I look at it, I walk on by! This Roden kit builds the early C-124A without the tip heaters nor the nose radome. The tip heaters are included, but the space for the radome has the part clipped off. In fact, it seems like a last minute decision as the polybag actually looks cut open on one end to allow a pair of nippers to get into the bag. This could just be happenstance, but that was my initial impression. Like all Roden kits of the last few years, the molding detail is very nicely done engraved lines. 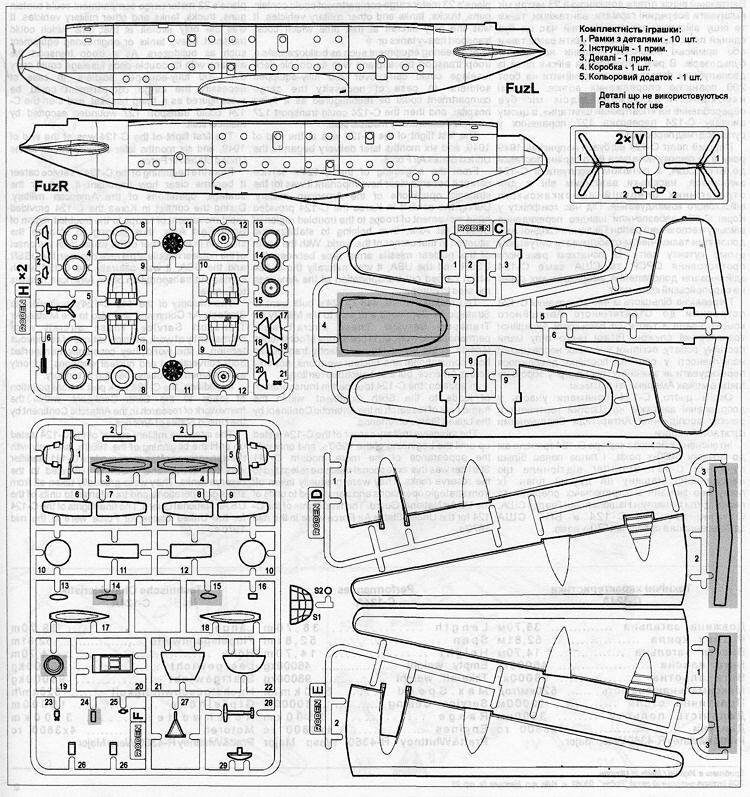 The kit has clear bits for the cockpit and what looks like a landing light lens, but it is not shown as being installed in the instructions. There is a fair cockpit with a pair of seats and instrument panel, but with the cockpit being painted black, you could easily paint the inside of the cockpit windows as nothing will be seen through the somewhat thick clear plastic. One does need to treat this kit as an upper level short run kit. No alignment pegs or holes and a few holes need to be drilled. 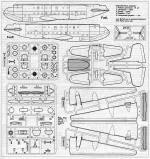 Such as for the outer flap hinges and the front of the engines for the prop shaft. The engine nacelles are a left and right side with just the forward row of cylinders, which is attached to a blanking plate. I appreciate that the entire forward cowling is a single piece as trying to fill forward cowling seams is a real chore in any scale. Landing gear is well done with all the wheels being in two halves. The kit has a myriad of antennas, and Roden provides measurements from known points for you to attach these items. One thing not shown in the instructions is how much weight you will need. Let us just say that you will need a lot so prepare for it. Items that are cast and not used are a one piece lower nose hatch and a pair of wing spars. The wing to fuselage join has some protruding attachment points which look to be sturdy enough. There is a full color painting and markings guide using Model Master paint references. The lone markings option is the box art plane. No unit is provided. The kit has no side windows, with decals being used for this purpose. The decals are fairly well printed with no registration issues and are glossy. Noticed a space in the 'Continental Division' tail band that is not shown on the box art. 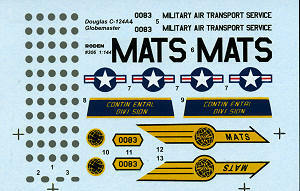 Also, the aft MATS insignia does not seem to have the full yellow design in the center. As many of you know, Roden decals can be problematical. Not sure what the odds are of aftermarket as this is such a new kit, but they would be welcome. I know this one will be welcomed by those who are into doing very big aircraft in 1/144 scale. Before this, the only option was Anigrand in this scale, and it was at least twice as expensive as this one is, with little chance to get it at discount. If you like the subject and are more comfortable with injected plastic, then this is one you should seriously consider. Thanks to Squadron Products for the preview kit. Get yours today at your local shop or other retailer.